This paper presents a new technique that couples tensor based image flow with robust statistical estimation models to produce dense accurate velocity fields. 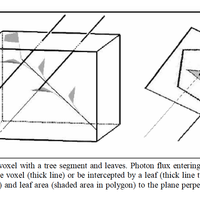 The 3D orientation structure tensor of the spatiotemporal varying light intensity field is used to estimate local non-rigid image motions. Previous work has shown that in highly uniform regions that lack salient corner and edge information or with noisy measurements the structure tensor approach can lead to spurious velocity estimates. The proposed algorithm improves estimates of the deformable image flow in these regions by minimizing a robust tensor functional that includes regularization and penalty terms. The robust tensor functional explicitly incorporates a temporal photometric consistency term. The combined robust tensor method is formulated as a global constrained optimization over the 3D spatiotemporal light intensity volume and recovers scientifically accurate velocity fields. 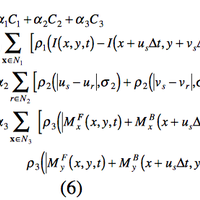 An attractive aspect of the robust tensor method is simultaneous segmentation and velocity estimation. Experimental results using image sequences of biological motion captured using a calibrated video microscope reveals new biophysical insights at subcellular micron scale resolutions. K. Palaniappan, H. S. Jiang, and T. I. Baskin. Non-rigid motion estimation using the robust tensor method. IEEE CVPR Workshop on Articulated and Nonrigid Motion, volume 1, pages 25--33, 2004.